Have you heard about SHUZI Technology? Shuzi Qi is a US-based technology company that is developing personal wellness and performance products using Nano Vibration Technology (NVT). Shuzi’s proprietary technology (NVT) has been shown to improve blood flow, enhance cellular communication and reduce painful inflammation. SHUZI also offers powerful protection against EMF (electromagnetic field) interference and has been tested and proven by highly respected doctors, health practitioners, physical trainers and athletes, with measurable results backed by Darkfield Microscopy Blood Cell Analysis, Thermal Imaging Centers of America and FDA Approved BioMeridian testing. The image to the left is actually my own hand before wearing the technology (left) and 15 seconds (middle) then 30 seconds (right) after putting the bracelet/technology on! Note the cooling throughout the middle of my hand. This is how it works: SHUZI’s NVT chip emits a subtle energy, a nano vibrational frequency that resonates throughout the body on a healthy cellular frequency. When worn, blood tests have shown SHUZI’s NVT to improve cellular communication and re-energize blood cells that may have otherwise been compromised or exhausted by everyday environmental and physical stress. I wear Shuzi, in fact I wear 3 shuzi items all the time (titanium bracelet, sports band and a newer item not on the market yet, the ‘Super Chip’). I’ve watched the tests and I’m blown away every time. 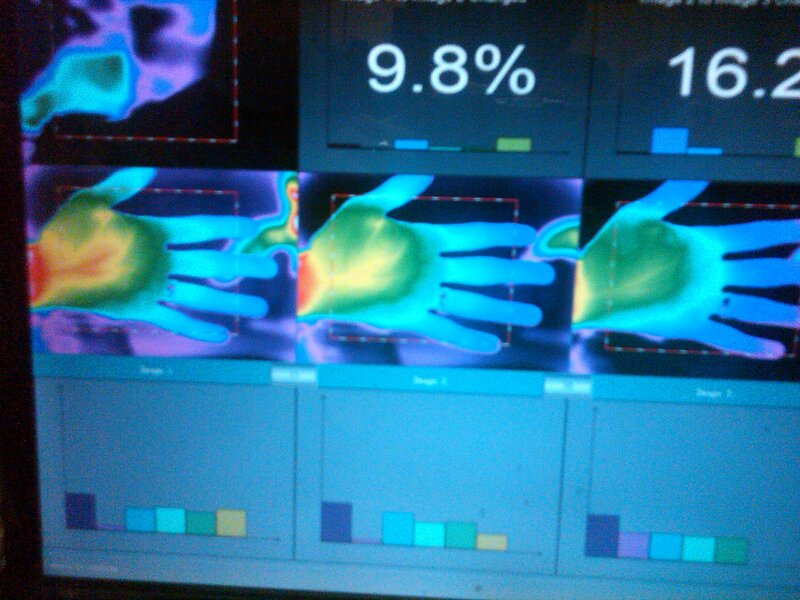 This is no Power Balance placebo effect..I know this becuase Shuzi has performed countless thermal tests and blood cell anlysis which show visible improvement in circulation and blood cell integrity!! I suggest EVERYONE at least check it out, it’s not cheap, but it’s not too expensive either, the technology is worth every penny.